It is a custom for Mamarazzi to go Chinese New year shopping with Yee Yee every year. This year was the same. Mamarazzi ditched Papa and me. After all the shopping has been done, all of us had dinner together at BB Ho Steamboat at Bandar Putri Puchong. Nah...we didn't have Steamboat. We had their Lala Fried Bihun. Wow...see the Lala. So BIG. Really terkejut to see such big Lala. 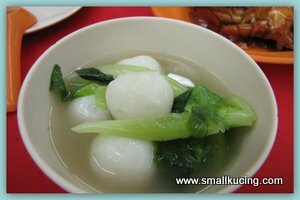 Ah Yee order Fishball for me. Then come the Crabs. 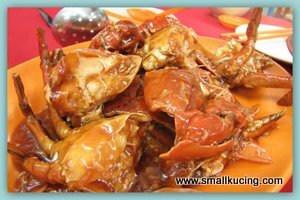 Crabs in Sweet and Sour Sauce. 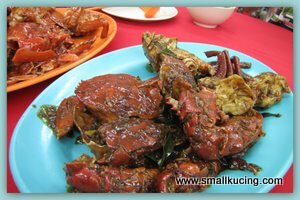 Kam Heong Crabs. Both dish were yummy. I had a mouthful of the Kam Heong Crab and my mouth was on fire. Guess I can't take much of spicy food gua. I wonder next year we will makan where pulak. happy new year to the kucing clan. all the best this rabbit year. 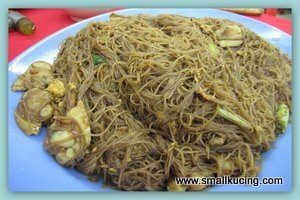 OMG lala bihun and crab again!!!! 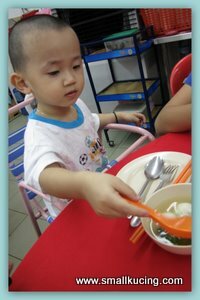 I thought I will read a steamboat dinner post? yum3, always lala and crab! i love them too! Bila u coming down KL? AH! The crabs look good!! yumm!